I’d like to think that I am a fairly well rounded person when it comes to the arts. When I say “arts”, I am referring to books, music, movies and theatre. As such, I have read, listened and watched and participated in the “arts”, and remembered most of it. So what comes to mind when I start to read this book? It hit me so quick I knew I was going to like this one no matter what I read. So, think of this book as The Princess Diaries meets The Tenth Kingdom. I say this with great affection because I loved both of these movies. friend, Lewis, is about to join her on the ride. Oh, and let’s not forget about the mean girl, Wanda, who decides she wants what Callie has and joins the duo. 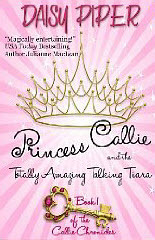 Learning she is a Princess, Callie uses her instincts, and Lewis’ smarts to follow an underground tunnel that leads to a magical world of Albion where she must defeat an evil Queen, who just happens to be the jealous sister of her dead mother. Callie will need to defeat her in order to save her mother’s homeland and people. Throw in magical dragons, gargoyles that can speak and a tiara that bites and you’ve got an exciting story about a young girl who finally learns to trust herself and let go of her fears. Every teen faces a moment like Callie faced, while it might not be as fantastic as was portrayed in this story, it is one that when successfully surpassed, life becomes completely different than was once previous. Hopefully for all of us and like Callie, it will be for the better.